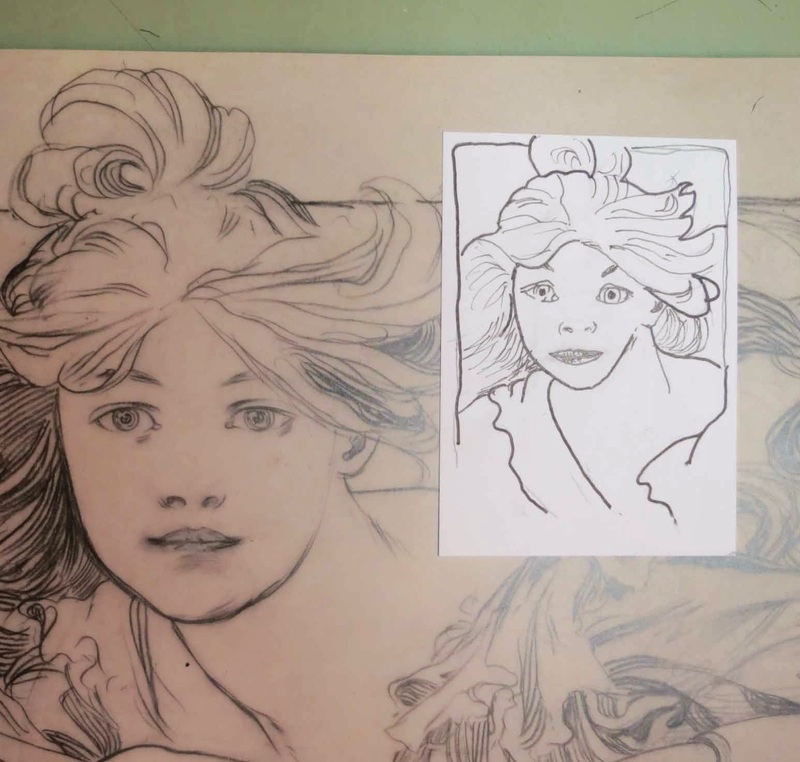 It took me a shockingly long time to decipher, for myself, that I love the poster art of Alphonse Mucha. I come to certain realizations rather late. I've recognized that this is my way and I've made a sort of peace with it; I'm not down with it, no, but it is what it is. We ship the information and move ahead. Once I realized that this was one of my visual loves I've read about as much as I possibly could. I've assimilated the central legend of the man, how a chance meeting with Sarah Barnhardt would catapult the man to the sort of overnight success that you so frequently hear about, that artist who worked patiently on his art until the lightning bolt struck and when it did, he so happened to be ready to catch it. His posters are, of course, justifiably gorgeous and give the eye back all the love it offers. Gismonda is memorable, La Samaritaine gorgeously intriguing. One wonders what sort of career La Barnhardt would have inscribed with today's supernovaesque media behind her. For my emotional money, though, the girl in the Cycles Perfecta ad has my heart, the way she beckons with her eyes and her open expression from the page. 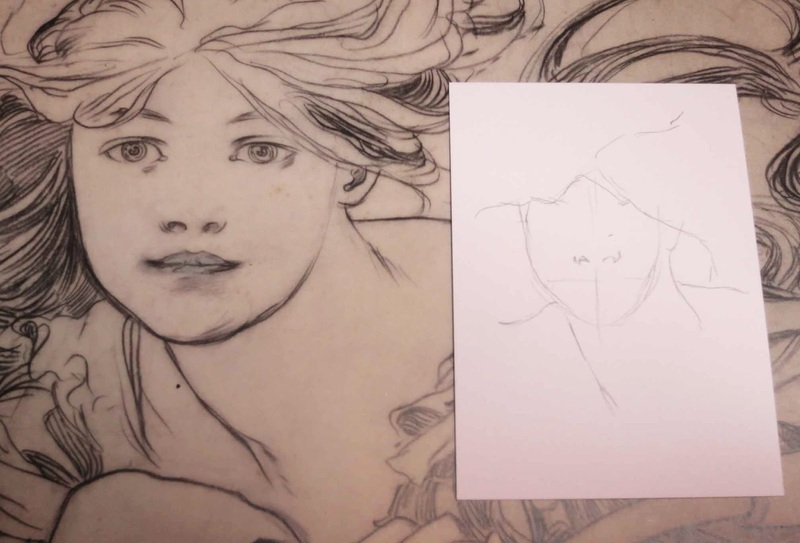 In the book I checked out from the Multnomah County Library, I found a photo of the rough sketch for Cycles Perfecta and, reduced to its opening pencil marks, it looked like something I could do … or at least, something I should attempt. I haven't drawn anything for a very long time. Stabilo (and Copic (not shown)); all courtesy my hard-earned bux. When you neglect your artistic jones for a long long time, you enter a sort of strange stasis. You start to feel as though you're keeping it in a box for just the right time. Then you open it and it feels awkward, stiff, but you use it anyway, because you've told yourself you've been away too long, and some people you love, who know you're shorting yourself until you do this thing, have never, oddly, given up on you even though you have, in a way given up on yourself. So, the drawing itself feels stiff and awkward. It's quite rewarding, actually, even though you don't get it done the way you want to get it done. Of course, it'll be work. You knew this already. Same thing as happens with someone whose let themselves get out of physical shape after being in great condition. You're lugging this weight. So, false-start here, bad line there. No matter. Do it anyway. And the result isn't great, but what did you expect? 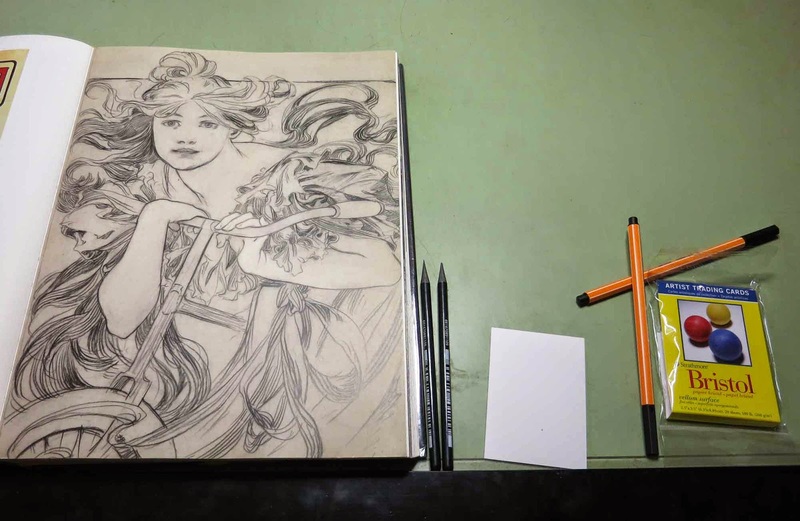 Mucha worked for years and did it every day. the result, seen below, does not satisfy me, but … but … I am happy for it. I did this thing. And the eyes are too wide and crabby; the curve of the face, comically-tragically asymmetrical. The mouth doesn't look anything like the mouth of the original. She looks like a rank beginner, which is what I'm back to being. I have only myself to blame. You use it or you lose it; but if I didn't have it to begin with at some time or another, it wouldn't have got me this far. Ahh, Square One. So we meet again.